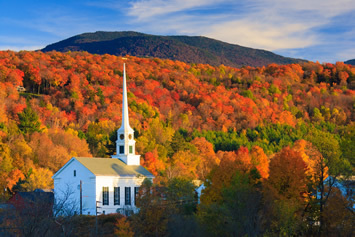 Come join our intimate and super-friendly group of Gay Daddies, admirers and friends aboard the Regal Princess on our gay group voyage to New England and Canada during the peak of fall foliage. Nothing compares to a sailing in and out of New York Harbor, with its gorgeous skyline and the Statue of Liberty right there, welcoming all to this great country. Hold your breath as we sail under the Verrazano Bridge (but don't worry, we'll clear it by several yards!). 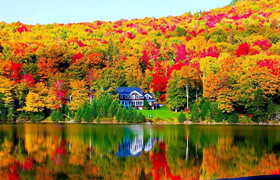 Explore quaint New England and charming Atlantic Canada when Mother Nature puts on her spectacular show of vibrant fall colors! The pages of history and stunning natural beauty blend seamlessly as you cruise the color-drenched shores of Canada & New England with Princess. Visit the iconic lighthouse at Peggy's Cove in Halifax, return to the Gilded Age in Newport and stroll down Boston's historic Freedom Trail. Or ascend Cadillac Mountain in picturesque Acadia National Park for one of the "Best National Park Experiences," according to Lonely Planet. On board, you'll dine like a New Englander on succulent crab cakes and lobster as the allure of the northern seaboard embraces you -- and leaves you changed forever. 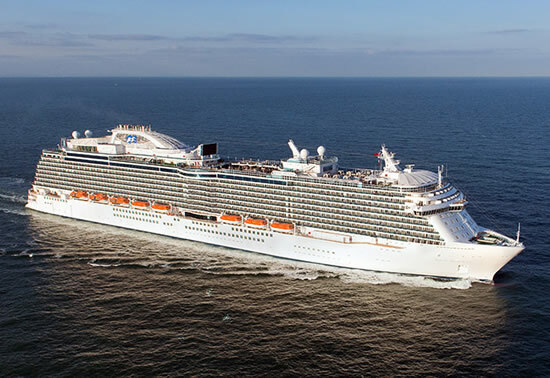 Your adventure starts on October 12, 2019, when we sail out of New York Harbor on the Regal Princess. Only 4 years old, she features the SeaWalk, a dramatic glass-bottom walkway 128 feet above the sea, which USA Today calls one of the "Top Gee-Whiz Features at Sea." 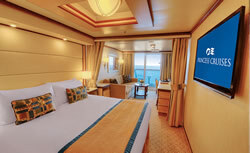 Cruiseline, CruiseCritic, and Avid Cruiser all rate Regal Princess 4 out of 5 stars. They say she is "unmistakably elegant, accomplishing something mainstream ships struggle with: finding a balance between fun and refinement." Regal Princess features two huge pools and six hot tubs, including a few in the Sanctuary - an extra cost (by the half-day, and well worth it!) 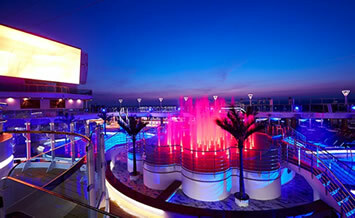 adults-only retreat with upscale lounging areas and attendants there to bring a chilled towel or light bite to eat. At night we can snuggle on deck to watch Movies Under the Stars on a huge 300-square-foot screen—complete with free popcorn! Inside, Berlitz says she is "...warm and attractive, with an abundance of earth tones that suit American tastes...". 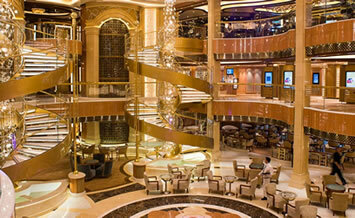 Regal has an extra large casino, an internet café, a library, a spa, gym, and much more. Oh, and there's a self-serve launderette on every floor (you can save on those valet charges, if you like!). 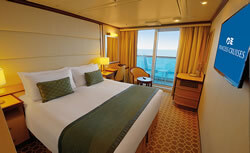 All cabins feature the exclusive Princess Luxury Bed. 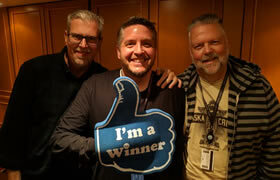 Designed by sleep expert Dr. Michael Brues and HGTV's Candice Olsen (who doesn't love HER talent?! ), these beds are the ultimate in stye, comfort and scientific research on a good night's sleep. 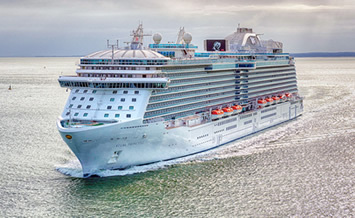 Regal Princess also includes several upgraded bathroom features not available on older ships: larger showers, hand-held, flexi-hose shower heads, and more counter space by the sinks. 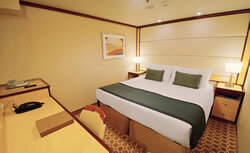 Comfort, style and convenience in every cabin on board! 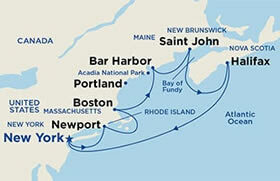 Our itinerary is a perfect blend of relaxing, fun, and awe. 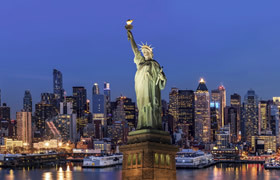 As we sail out of New York City, we'll pass by The Statue of Liberty and Ellis Island (perhaps your ancestors knew that island when they first arrived in America?). The Manhattan skyline (Empire State Building, World Trade Center, Chrysler Building and hundreds more) will be even more stunning from the sea than it was by land or air. We pass under the Verrazano Bridge—it's amazing this huge ship can even make it with only a few yards to spare!—and out to the Atlantic Ocean. Then we'll gather for a hosted Meet-n- Greet Party where you'll meet your fellow cruisers and start making new friends right away. In the 19th century, Newport was America's Versailles. It was here that the great merchant princes and robber barons of the Gilded Age erected the elaborate summerhouses they so ingenuously dubbed "cottages." At the height of its splendor, a Newport season was a giddy whirl of grand galas, yacht races and elaborate beach picnics for assorted Vanderbilts, Astors and Morgans. 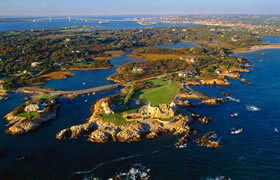 Today, we can marvel at the splendor of great mansions like The Breakers, The Elms, or Rosecliff. 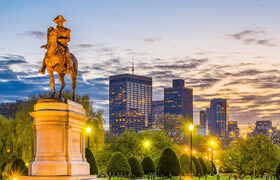 Hailed as the "Cradle of American Independence" and the "Athens of America," Boston is filled with historic sites. It is a city every American should visit at least once. Follow the Freedom Trail along three of the most historic miles in the country (there are a few shortcuts I will share with you to save time and steps!). See the site of the Boston Tea Party, trace the route of Paul Revere's famous ride, and stand on the bridge where Minutemen fired "the shot heard 'round the world." In the old Charlestown Navy Yard you can see the USS Constitution, the nation's oldest commissioned warship. We'll be in port late enough for an early dinner in North Boston for some of the best Italian food this side of the Atlantic. And don't forget to stop at Mike's for the best cannoli anywhere! Established by individual donations, Acadia National Park is a stunning intersection of sea-scoured shores, towering cliffs, and forested mountains. This is the Maine you see featured on calendars in malls everywhere. Mount Desert Island was a resort destination well before the establishment of Acadia National Park in 1919—the first one established east of the Mississippi. 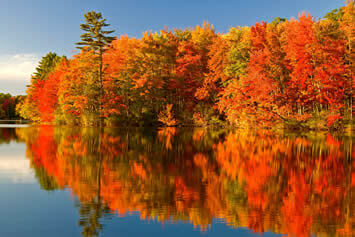 It is now one of the most visited national parks in America. 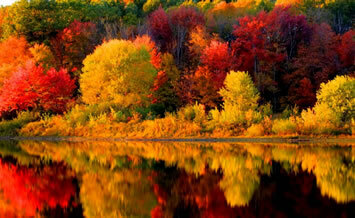 Acadia's 35,000 acres are studded with natural wonders. In addition to the stunning landscape, some 50 species of mammals are often spotted including moose, black bear and white tail deer. 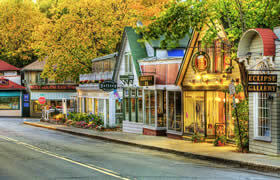 Bar Harbor itself has the best boutique shopping you'll see on this cruise. Lobster ice cream, anyone? No, I'm not kidding—they actually sell that here! But I highly recommend the blueberry ice cream…or blueberry pie…or blueberry bread…or blueberry beer. They put those delicious little guys in everything, and it's all good! Welcome to quaint Saint John, Canada's oldest settlement and gateway to scenic New Brunswick. This is also where many American Loyalists fled after the American Revolution, and they did leave their mark: historical sites abound. There are also some great shopping areas. But Saint John's best-known attraction is the Reversing Falls. Twice daily, the powerful tides of the Bay of Fundy (the highest tides in the world) rise faster than the river can empty. So the tide pushes the river backwards, upstream. An underwater ledge 36 feet below the surface causes the river to tumble backwards, thus creating the reverse rapids. The effect is spectacular! 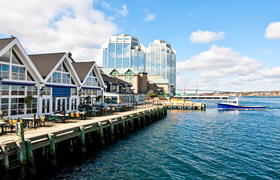 Our second Canadian port is delightful Halifax, the capital of Nova Scotia. We dock right next to the Historic Properties Development. These charming early 19th-century wood and stone buildings along the waterfront have all been fully restored. The cobblestone streets and long boardwalk are now lined with an array of lovely boutique shops, pubs and cafés. Elsewhere, heavy iron gates mark the entrance to historic Halifax Public Gardens or climb the hill a bit to explore the Halifax Citadel National Historic Site. While it never saw battle, it's an excellent example of a 19th-century British fort. Also in town is an informative maritime museum and one of Canada's premier art museums. For the quintessential Atlantic Provinces scene, head to Peggy's Cove, an enchanting little bay on the rugged Atlantic coastline. Colorful houses, rolling granite bluffs, and an old lighthouse give the area real Canadian charm. Our last day is at sea. Relax, unwind and enjoy your final vacation day. 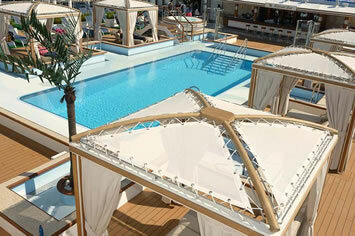 Lounge on your private balcony or near one of the pools, or maybe even find a quiet nook to settle in with a book. Want to be more active on your last day? Play bingo, work out at the gym, dance all night, watch a movie, attend a cooking seminar, soak in a hot tub, watch a sunset (or a sunrise), play trivia games, sing along at the piano bar, do some wine tasting, check your email or surf the internet, grab a snack, watch live entertainment, get lucky in the casino, indulge in a spa treatment, catch the game in the sports bar, and on and on. 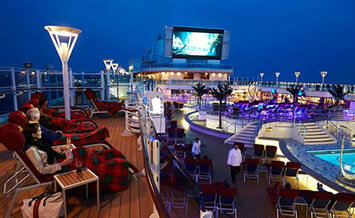 Taxes & charges of $210 pp, Gratuities and optional insurance are additional.